To win a free copy of The Secret of the Glass, leave a comment with the name of her two published books and the one which is in progress and tell us why you love Venice. THE COURTIER’S SECRET, was published in February of 2009. 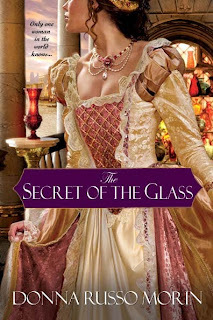 Her second, THE SECRET OF THE GLASS, will be released in March of 2010. And she is currently hard at work on her third historical fiction work, tentatively entitled TO SERVE A KING.